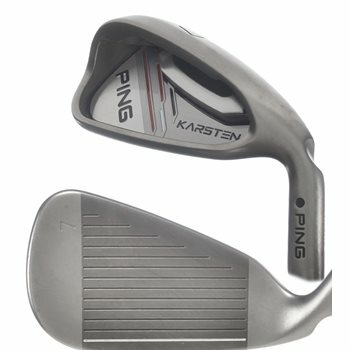 The Ping Karsten iron set is designed for players of all skill levels and features hybrid long-iron replacements for maximum playability throughout the set. The 17-4 steeel irons feature a wide, forgiving sole that helps move the center of gravity lower and deeper, resulting in improved forgiveness on off-center shots. The Custom Tuning Port (CTP) integrates with the wide sole to increase ball speeds and helps to produce a solid feel and sound. These were released in 2014.